So, in Dark Horse's newest release, X #0 (which collects three stories originally appearing in Dark Horse Presents) there's a masked vigilante cleaning up the streets of the town of Arcadia by spilling blood in the gutters and turning ham faced hoodlums into sausages. As far as I can tell, it is all because writer Duane Swierczynski and artist Eric Nguyen are full of hate. Serious and ugly hate. I can't think of any other reason for the existence of this book other than somebody's got a fat ax to grind. Because all we got here is a vengeance plot. A masked guy is toting around some weapons and using them to splatter faces across the pavement. Swierczynski provides no insight into why this individual has chosen this course of action, except... you know... ham faced hoodlums are … what do you call it? Bad? And deserve to become sausage? Or something. I swear to you that there is even a moment in this book when a "sirloin of psychopath" is mentioned. You can't expect me to take that seriously? Can you? But what is the story? Ostensibly it's a murder mystery. Eleven boys have been drained of all of their vital fluids and have had their brains liquefied and sucked out. These victims are then left in various locations around town, the latest being on the couch of Ed and Alice Crewel, propped up and watching reruns of Star Trek. In addition to these horrors, there's been a woman murdered. Her killer has drilled her eyes out and "wired her system up like a machine." As the officer on the scene says, "She would've worked … if the guy who did this hadn't crossed some wires." Grizzly stuff this -- the murder of children and mothers is fraught with all sorts of emotional, psychological, and mythological resonance. In this, Sienkiewicz is not subtle. Stray Toasters is an art book. 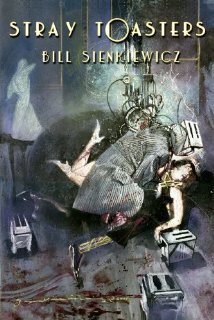 Sienkiewicz pulls out all of his tricks here and as a visual piece of storytelling it is unparalleled -- beautiful, horrific, confusing, stunning, enigmatic, uncanny -- in this Sienkiewicz shows his mastery, and this book is unquestionably his masterpiece. But it is the story that leaves me with that feeling that I can't shake. It is in this story that my answers lie. I just can't figure them out. Jason Sacks: I love books that show me a place that I could never have imagined. I love meeting characters who are complex and intriguing and thoroughly unique. And I love watching those characters solve their strange problems in ways that fascinate and spark an odd sense of recognition in me. 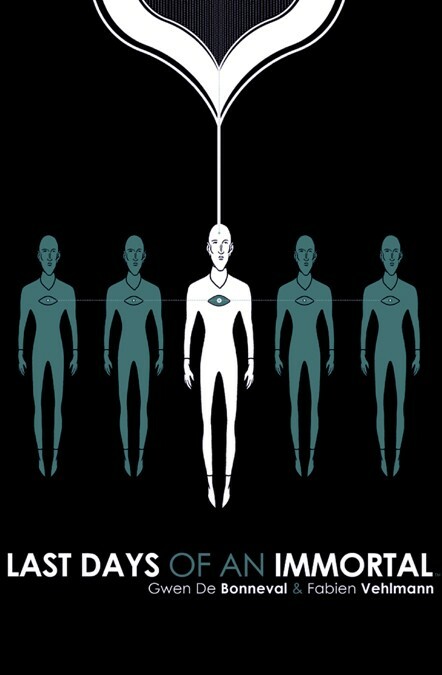 Elijah, the lead character in this breathtaking new graphic novel, is a member of the "Philosophic Police," a force that must solve intergalactic crimes and, more importantly, determine if the events in question even constitute a crime. Elijah is a kind of celebrity or rock start of the Police force, constantly asked for his autograph by ordinary people and granted special societal privileges, because he has the preternatural ability to determine the reality of crimes and to push for peace between alien races. Elkin: So, how's that mid-life crisis going, Sacks? Have you bought the red sports car? Have you decided to open up the vegan cocktail bar you've always dreamed about? Have you started hanging out in malls? What is it about us men in our forties? Why do we become awash in the realization, suddenly, that the lives we are living are not the ones we expected – and, even more importantly, why does that MATTER so much? Perhaps there are those of us who lay awake at night tracing through our decisions trying to find the un-event that took us down the path away from our dreams. Perhaps there are those of us who, upon finding this moment, try to hit the reset button in hopes of starting anew. Perhaps there are those of us who, by trying to hit that reset, come to understand that the lives we have ended up with are actually where we are meant to be. Dylan Williams is one of those men, and his film, Men Who Swim, documents that journey of discovery. When Dylan Williams moved from Wales to Stockholm for love, his Swedish language teacher told him that the key to Swedish society was to join a club. As Williams finds himself pushing forty and settled down with a wife and two kids while working at a job that he feels is squandering his potential, on top of feeling like a true fish out of water, those words resonate even stronger for him. The documentary Men Who Swim is about Williams' embracing his language teacher's advice. He joins a club called the Stockholm Art Swim Gents, a group of middle age men who want to master the complex and challenging sport of Synchronized Swimming. That's right. Men synchronized swimming. Swedish men. Men Who Swim is a Coming-of-Middle-Age documentary, and I gotta tell you, Sacks, this film left a big old cheese grin on my face by its end. It is a story that I connected to because it is a story about connections and how, in those connections, we find ourselves. And sometimes by finding ourselves, we find our place in the world. Even if that place is exactly where we thought we wanted to get away from in the first place. Even if that place is in a pool, with a bunch of other men in Speedos, performing synchronized dance moves. Paul Brian McCoy: For as long as I can remember liking movies, I've always had a fondness for the hard-drinking tough guys. When I was in high school, I had a poster of Humphrey Bogart on my wall and I added my own voice balloon with his famous deathbed quote: "I should never have switched from Scotch to Martinis." The talk show tales of Peter O'Toole, Richard Harris, Richard Burton, and Oliver Reed were historic as far as I was concerned. 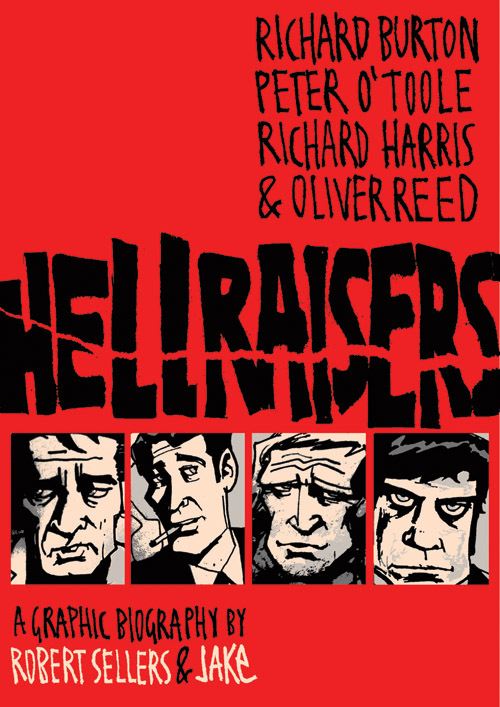 So I was very excited to discover that Robert Sellers was adapting his biography of those four madmen, Hellraisers, into a graphic novel -- and even more excited when I discovered that JAKe was doing the artwork. However, for some unknown reason, rather than just stick to the biography format that works so well in prose, Sellers reworks his narrative to incorporate an A Christmas Carol framework that, quite frankly, didn't work at all for me. The graphic novel tells the tale of drunken reprobate Martin, who on Christmas Eve has just cocked up his family's holiday. Later that night, he's visited by the ghost of his dead alcoholic father to tell him he is going to be visited by four spirits (pun whole-heartedly intended) who will show him the error of his ways. Then the ghosts of Richard Burton, Richard Harris, Oliver Reed and the totally corporeal but still incorporeal Peter O'Toole, all take him on guided tours of their booze-besotted lives. And even though none of them ever really regret the damages they've done through lives as Hellraisers, Martin somehow learns his lesson and returns home a better man. AH, MAN … YOU HAVE GOT TO BE KIDDING ME. They warned me that if I kept diving into the bargain bin, sooner or later I would have to deal with this. Sure, they said, you can smile your way through all those old Valiant and Eclipse wonks and early Image splodges, for these are the staples of the bin. Sure, you can find lost gems therein that will cause you to question the nature of art. Sure, you can sort through the missteps of passionate independent creators with no discernible talent. You can do all of these things they said and make it out the other side. But sooner or later, they said, sooner or later if you spend too much time in the bin you are going to have to deal with Guy Gardner: Warrior. Today, my friends, is that day. October 1995 found OJ not guilty, a Million Man March on DC, and the death of Kingsley Amis. Mr. Bungle released Disco Volante, Ubisoft released Rayman, and the Clinton Correctional Facility released Tupac Shakur (thanks to Suge Knights $1.4 million bail). In October 1995 DC Comics released Guy Gardner: Warrior #35, the ramifications of which I now have to deal. In the name of full disclosure before beginning this review, I need to let you know that as far as I am concerned, Jay Piscopo makes comics just for me. I've never met the guy, but I swear he keeps having a hand in books that seem to come out of the daydreams of my childhood. It's kinda creepy in a way, but I don't want him to stop. The last Piscopo book I read was the wonderful Commander X All-Star Special #1. Now he's back with Captain Midnight Special. Though he's illustrating Brian Augustyn's story, the book's feel is all Piscopo and that's all right with me. Five Literary Ghosts? Ooooh boy -- that's enough to get the English teacher in me all a'flutter -- I'm thinking Hamlet's father, Jacob Marley, Beloved, Madeline Usher, and some Turn of the Screwshit. But no.... that's not what we are talking about. Rather, in Five Ghosts, Fabian Gray is possessed by The Wizard, The Archer, The Detective, The Samurai and The Vampire. As it turns out, he's not really possessed by Literary Ghosts, as much as by Literary Tropes. But hey, that's all well and good because, really, it doesn't matter. It doesn't matter because, as Image wants us to know, "A BOLD NEW ERA OF PULP ADVENTURE COMICS BEGINS HERE" and in Pulp Adventure stories, it's best to work with what you know. All this aside, let me be straight with you: Five Ghosts is pretty great. Did I ever tell you that this here jacket represents a symbol of my individuality and my belief in personal freedom?